This post appears courtesy of Pew Research Center. The full study by Maeve Duggan and Aaron Smith of Pew Research can be found here. As the recent election whirlwind passed through, a new Pew Research Center survey of U.S. adults found that political debate and discussion is indeed a regular fact of digital life for many social media users. 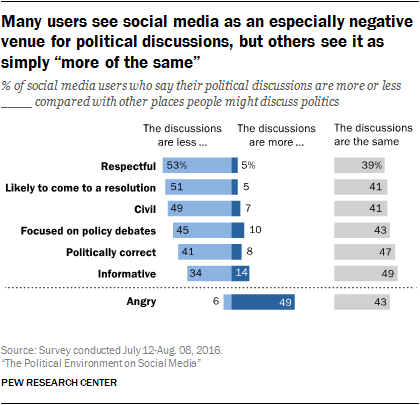 Some politically active users reported to enjoy the heated discussions and opportunities for engagement that this mix of social media and politics facilitates, but a larger portion expressed annoyance and aggravation at the tone and content of the political interactions they witness on these online platforms. More than one-third of social media users are worn out by the amount of political content they encounter. 59% say their social media interactions with those with opposing political views are stressful and frustrating. 64% say their online encounters with people on the opposite side of the political spectrum leave them feeling as if they have even less in common than they thought. The study also found that political content is as prevalent on Facebook (where users mostly follow people they know personally) as it is on Twitter (where users tend to follow a wider mix of connections). Data in this report are drawn from the July wave of the panel, conducted July 12-Aug. 8, 2016, among 4,579 respondents (4,165 by web and 414 by mail). The margin of sampling error for the full sample of 4,579 respondents is plus or minus 2.4 percentage points. Members of the American Trends Panel were recruited from two large, national landline and cellphone random-digit-dial (RDD) surveys conducted in English and Spanish. At the end of each survey, respondents were invited to join the panel. The first group of panelists was recruited from the 2014 Political Polarization and Typology Survey, conducted Jan. 23 to March 16, 2014. Of the 10,013 adults interviewed, 9,809 were invited to take part in the panel and a total of 5,338 agreed to participate. The second group of panelists was recruited from the 2015 Survey on Government, conducted Aug. 27 to Oct. 4, 2015. Of the 6,004 adults interviewed, all were invited to join the panel, and 2,976 agreed to participate. Erin Ford is an intern at the Institute for Public Relations and a Masters Student at the University of Florida’s Hough Graduate School of Business. Follow her on Twitter, @erinfordpr.